A very noisy debut from this Belgian group comprised of Gilles Aubry (computers), Antoine Cheesex (saxes), Vincent Berberat (bass) and Marc Fantini (drums). Candlelight Technology’s eight tracks all share a similar ethos for the more abstract elements of post-punk experimentalism. “Crack Brained,’ for instance, seethes with the latent industrial violence of early Cabaret Voltaire and Pere Ubu; its lethal fuzz bass rampages through the meltdown mix of electronically filtered white noise like an angry mastodon through a nuclear power plant. Gilles Aubry’s unique use of computer-generated effects and soundscapes instantly reminds one of Allen Ravenstein’s similar use of electronics with the early Pere Ubu to create wholly static, synthetic atonal backdrops. Other pieces such as “Contonuous” and “Footnote” pursue a kind of abstract electronic minimalism reminiscent of Dome and Metal Urbaine, though without the latter’s use of blazing, cobalt-fueled guitar mania. Here a panoply of sounds and effects buzz and twitter around Berberat’s sonic-overload bass and Cheesex’s Coltrane-influenced tenor sax improvisations. 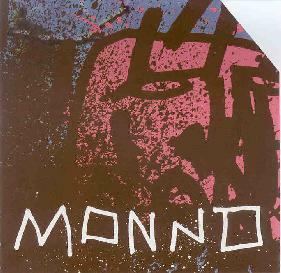 If there’s such a thing as alien punk, Monno is definitely its most virulent exponent. However, Candlelight Technology isn’t for the faint of heart. But for those who can’t get enough of such sonic reducers as Throbbing Gristle, SPK or Zoviet France, this may be a disc worthy of your attention. For more information you can visit the Conspiracy Records web site at: http://www.conspiracyrecords.com. Contact via snail mail c/o Conspiracy Records; PO Box 269; 2000 Antwepen 1; Belgium.